According to reports, the FDA has accepted a petition created by Rep. Edward J. Markey (D-Mass.) to ban the use of bisphenol A (BPA) in baby formula containers. In his petition, Markey used an unusual provision that allows people to petition for an official change to food additive rules if said person can demonstrate that a particular additive is no longer in use by the food industry. 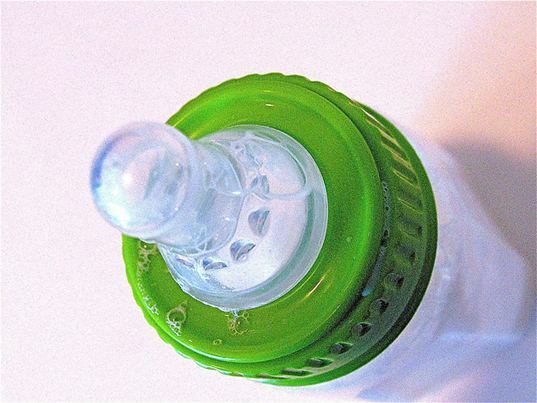 Markey’s office polled the industry to determine BPA’s prevalence in formula packaging. When Markey found that major manufacturers no longer use BPA, he sent off his petition to the FDA. Apparently, the FDA has sent Markey a letter noting that they’ll attempt to complete a scientific review of his request within 90 days. Of course, for anyone following the recent FDA + BPA shenanigans, the FDA’s reply probably feels 100% disingenuous. The FDA already rejected NRDC’s petition to ban BPA in food packaging last March, and that only happened after a lawsuit and three long years of thinking it over. How come? The FDA feels that BPA poses little to no danger, thus there’s no need to ban it. It’s super that formula manufacturers say they’re no longer using BPA in formula cans, but as for an FDA sanctioned ban, I’m guessing there’s no way on earth that’ll happen. In fact, I’d wager that the “scientific report” the FDA promised Markey is even a long shot. An official BPA ban would simply be entirely out of character for the FDA. Still, I’m just one person with one opinion. Tell us what you think in the comments below. According to reports, the FDA has accepted a petition created by Rep. Edward J. Markey (D-Mass.) to ban the use of bisphenol A (BPA) in baby formula containers. In his petition, Markey used an unusual provision that allows people to petition for an official change to food additive rules if said person can demonstrate that a particular additive is no longer in use by the food industry. Markey's office polled the industry to determine BPA�s prevalence in formula packaging. When Markey found that major manufacturers no longer use BPA, he sent off his petition to the FDA. Apparently, the FDA has sent Markey a letter noting that they'll attempt to complete a scientific review of his request within 90 days. Of course, for anyone following the recent FDA + BPA shenanigans, the FDA's reply�probably�feels 100% disingenuous. The FDA already rejected NRDC's petition to ban BPA in food packaging�last March,�and that only happened after a lawsuit and three long years of thinking it over. How come? The FDA feels that BPA poses little to no danger, thus there's no need to ban it. It's super that�formula�manufacturers say they're no longer using BPA in formula cans, but as for an FDA�sanctioned�ban, I'm guessing there's no way on earth that'll happen. In fact, I'd wager that the "scientific�report" the FDA promised Markey is even a long shot. An official BPA ban would simply be entirely out of�character�for the FDA. Still, I'm just one person with one opinion. Tell us what you think in the comments below.